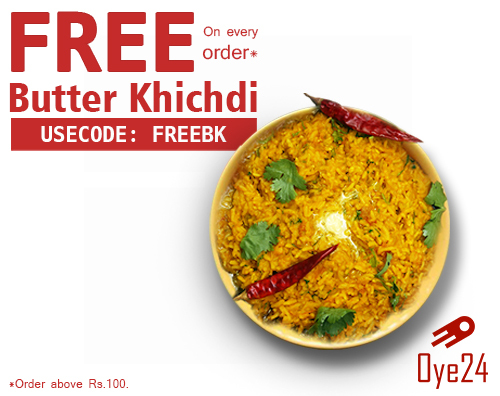 Use Code 'FREEBK' & Get 1 FREE BUTTER KHICHDI on order above Rs 100 from Oye24's App/Website. To enjoy this Happy Deal..
1. Offer valid from Monday 15-01-2018 to Friday 19-01-2018. 2. Offer valid on product Butter khichdi (Serves1 and Serves2). 3. Offer valid on Mobile app and website. 4. Offer valid on online payment and cash on delivery. 5. Customer has to pay complete amount of order at the time of delivery. 6. No coupon code is required. 7. Get cashback of Rs 119 before 23-JAN-2018. 8. Cashback will be valid till 28th February 2018. 9. Offer valid only once for a mobile user. 10. This offer cannot be clubbed with any other offers like discounts, reward, referral or cashback. Use Code 'PEHLIBAR' & grab 100% cashback* on order from Oye24's App's Menu. Offer valid on Mobile Apps (Android & IOS only). Offer valid on both online payment and cash on delivery. The customer has to pay complete amount of order at the time of delivery. Get cashback upto Rs. 100* after delivery. Offer valid only on first order from the mobile user. This offer cannot be clubbed with any other offers like discounts, reward, referral or cashback. Download OYE24 app or log in to website, place your order and apply coupon code FREEBK , get a COMPLIMENTARY BUTTER KHICHDI on every order above Rs 100 between 6 JUNE to 8 JUNE 2018. *TnC applied. Offer valid from Monday 06-06-2018 to Friday 08-06-2018. Offer valid on every order amount above Rs 100 (excl. of GST). Offer valid only on Mobile app and website. Offer valid on mobile payment and cash on delivery. Apply coupon code FREEBK. Using coupon code is mandatory for the offer. If coupon code is missing from the order no refund/replacement/cashback will be provided. Complimentary Serves 1 -Butter Khichdi will be delivered with order. Offer valid only once for a mobile user. On order cancellation, one can use this offer code on the next order with the registered number of the cancellation. Use Code 'BOGO' & Order 1 Butter Khichdi & Get 1 FREE on order from Oye24's App/Website. Offer is valid on Mobile App (Android & IOS) and website only. Offer is valid on both online payment and cash on delivery. Applying coupon code BOGO is mandatory. In case of coupon code missing no offer benefits will be provided. Place order of two Butter Khichdi amount of one Butter Khichdi. Offer code not valid on order of 1 Butter Khichdi. (i.e. when you order 3 Butter Khichdi, you will only get only one complimentary Butter Khichdi and you have to pay for 2 Butter Khichdi). Offer is valid once per day per user. Offer is valid between 11 AM to 8 PM 8 till 02-08-2018. Applying coupon code NEWBK is mandatory. In case of coupon code missing no offer, benefits will be provided. On every order with coupon code FREEBK, one complimentary butter khichdi will be provided. If the coupon code is missing from the order no refund/replacement/cashback will be provided.Complimentary Serves 1 -Butter Khichdi will be delivered with the order. Offer is valid between 24-09-18 to 28-09-18.